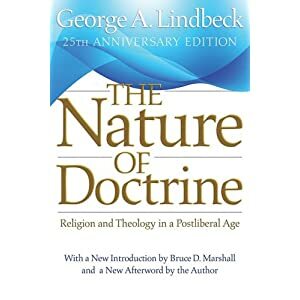 George Lindbeck’s The Nature of Doctrine is probably the hardest book I’ve had to read. Yes, sales he is more difficult to read than Barth. But just because he’s a hard read doesn’t make him irrelevant. Indeed, NOD has had a huge influence on various strains of Christian thought. Protestant Liberalism and conservative evangelicalism have both been shaped in the last 25 years by the theory introduced in NOD. Lindbeck suggests that there has been two main ways of understanding doctrine, the Cognitive-propositionalist approach (CPA) and the Experiential-expressivist approach (EEA). Cognitive-propositional: This approach to doctrine is concerned with verifiable fact. It is about “proving” that such-and-such doctrine is metaphysically true. He says that this was the pre-liberal approach to religion. Experiential-expressivist: This approach to doctrine is concerned with symbols. It is about finding the common human experience and about reducing doctrine to it’s universal principle that can be found across religions. The experience of “absolute dependence” is key to this approach. This has been liberal protestantism since the days of Schleiermacher. The CLA is based upon principles of cultural anthropology (Clifford Geertz) as well as theory of language (Ludwig Wittgenstein). So, a CLA means that “to become a Christian involves learning the story of Israel and of Jesus well enough to interpret and experience oneself and one’s world in its terms.” (NOD, 20). It means that just like becoming fluent in a language, a person who becomes a Christian learns the language and practice; that is, how to think, act and feel within the Christian tradition. A CLA approach means that we don’t have to “prove” the veracity of doctrines, nor do we have to reinterpret doctrines so that they can be explained to those outside of the faith. Indeed, it is very possible that there will be doctrines that will not ‘translate’ to other religions. (Example: there is no Christian equivalent to Buddhist Nirvana). First, diagnosis let me say that I am awesomely impressed with this book. James McGrath has done an awesome job pulling together different scholars to examine the interaction between science-fiction and religion. Stay tuned for several posts on this book as I work through the various essays. Today, buy viagra we look at Elizabeth Danna’s essay, diagnosis ‘Looking Out for No. 1: Concepts of Good and Evil in Star Trek and The Prisoner.’ I suggest that Dr. Danna has mis-read, or over-read some aspects of Star Trek in two places in particular: her analysis of the episode “Mirror, Mirror”, and second, her analysis of Captain Kirk’s name. But to do justice to this analysis, I must call on my resident TOS expert. My field of expertise lies with TNG and DS9, and so I turn to one more qualified to look at these issues. In the classic TOS episode “Mirror Mirror,” Kirk et al. find themselves in a parallel universe, switched with their counterparts by a malfunctioning transporter. In this mirror ‘verse, the Federation of Planets never existed, and a tyrannical Empire rules in its place. The crewmembers from “our” universe cope with life in the cruel mirror universe (promotion by assassination, Spock with a beard, etc.) while their Imperial alternate selves fail to cope with the Federation’s way of running a starship (and a beardless Spock). Federation Kirk talks Imperial bearded Spock into leading a revolution, while Imperial Kirk rants and rages at Federation beardless Spock. Once everyone is eventually returned to their native universes, beardless Spock gets to take yet another verbal jab at human nature (“brutal, unprincipled, uncivilized, treacherous; in every way splendid examples of homo sapiens. The very flower of humanity.”), and everyone learns a valuable lesson (such as avoiding the dang transporter; that thing is more trouble than it’s worth). It seems to me that Elizabeth Danna saw a valuable lesson that wasn’t there, and it had nothong to do with avoiding the transporter. In her chapter, Danna contrasts the presentations of evil (and how to deal with it) in the TV shows Star Trek (TOS) and The Prisoner. Most of her TOS analysis is unproblematic: The episode “The Enemy Within” (oh look, another transporter malfunction) tells us that humans’ “negative side” is the source of our drives, and that the solution is for reason to rule and properly order it. “The Alternative Factor” creates the powerful image of a man locked in eternal battle against his evil self. “The Savage Curtain” shows that the line between “good guys” and “bad guys” is not as clear-cut as an alien rock-monster might want it to be. “Day of the Dove” shows us that racism can be overcome by a sufficient quantity of hearty manly (and Klingon-ly) laughter. My disagreement involves her treatment of “Mirror Mirror.” Danna argues that “Mirror Mirror” is a lesson in the necessity of an outside force that will defeat human evil. In this case, Imperial bearded Spock must overthrow Imperial Kirk and take command of the Enterprise; in essence, deal with Federation Kirk’s evil twin for him. I see this as reading too much into the episode. “Mirror Mirror” does provide us with a couple of opportunities to reflect on human evil (if Federation beardless Spock is right, then we are savages at heart, and it is only the laws of civilization that keep us from that fate), but the most salient message appears to be one of identity: Spock is a man of integrity in both universes, but Imperial Kirk is quite comfortable as a merciless thug. What does that say about the factors that make us who we are? And there is some commentary on society and the inherent instability of tyrannies. But using Federation Kirk and Imperial Kirk as representatives of the good and evil within the human heart goes too far beyond what is written. Speaking of reading too much into things, there is the matter of Kirk’s name. Danna claims that “James Tiberius Kirk” represents ambition and deviousness (“James” as an Anglicized “Jacob,” he of the stew-for-birthright scam) balanced with moral discipline (“Kirk” being the Scottish word for “church”) with a touch of Roman profligacy tossed in the midst. The fact that Captain Kirk was named “James” after Gene Roddenberry’s uncle (and also for an old boyfriend of his mother’s), and that “Tiberius” was chosen because GR’s grandfather was fascinated with Roman history (and that Kirk’s middle initial was “R” instead of “T” in the second pilot episode “Where No Man Has Gone Before”) seem to lessen any possible deep symbolism implanted by GR in the name. The formal “meaning” of characters’ names does not always provide us with a peek into their souls. After all, “Gomer” means “famous battle,” but that doesn’t provide any insight into Gomer Pyle. Look what was waiting for me in the mailbox! Too Much Religion in Science Fiction? Angels, purgatory, limbo and monotheistic/polytheistic religious wars -– each has its place in science-fiction, but they are merely an element. They should not be the core of a science-fiction story. Relying too heavily on these elements in the place of true science-fiction only serves to alienate the very audience that such shows seek to engage…It is time to get science-fiction back on track. Where is the science? In today’s sci-fi, we want to be challenged by the possibilities of what lies ahead if such things as time travel, alternate universes, alien life and the rise of artificial intelligence come to fruition. Give us more of that. Now I will admit that my sci-fi tends towards the Star Trek Universe, Babylon 5 (and its spin-offs) and Firefly, so I can’t comment directly on Lost or BSG. But I do think that Tiffany is missing the fact that alot of sci-fi has at its core religious themes. Good sci-fi looks at questions about humanity: What is good and evil? What is the soul? How do we learn to get along with each other? What is the afterlife? What is sin? What is death? What is the good life? True, Gene Roddenberry’s Star Trek was pretty atheistic, but have you noticed that the less Roddenberry had direct control over the franchise, the more elements of religion were explored? It started with Star Trek: TNG (think about Worf and the Klingon religion, particularly the episode where Kahless, the Messiah of Kronos, returns), and hit full-tilt with DS9 and Captain Sisko being practically a god to the Bajoran people (he was emissary to the prophets aka the “worm-hole aliens”). Babylon 5, written by J. Michael Straczynski, has religious themes and elements all throughout the show. From different species, cultures and religions having to learn to get along through channels of diplomacy (the whole reason for the creation of the Babylon 5 station), to explorations into the nature of the soul (Delenn being attacked by the soul-hunter), to the ultimate battle of order versus chaos (Vorlons versus the Shadows, a direct reference to the Babylonian creation myth and the entire reason that JMS used the name “Babylon” for the series), Heck, Captain John Sheridan is accused of having a Messiah-complex, and Commander Sinclair becomes Valen, the spiritual leader of the Minbari. All of these shows, while having lots of futuristic technology, aliens, transporters and space ships, had at their core an analysis of humanity. And religion plays a big role in how humanity thinks, behaves and feels. Add to that the many classic novels that have had religion at their core, like Niven and Purnelle’s The Mote in God’s Eye and especially Frank Herbert’s Dune, and the notion that good sci-fi should be nonreligious becomes increasingly unsupportable. If you look at the long history of human society, religion — whether you describe that as organized, disorganized, or the various degrees of accepted superstition — has always been present. And it will be present 200 years from now… To totally ignore that part of the human equation would be as false and wrong-headed as ignoring the fact that people get mad, or passionate, or strive for better lives.